One of my favorite ways to make Disney inspired food art is by making smoothie bowls! Mix a nickel sized amount of coconut oil with dark chocolate, and melt in microwave or stove top. Cut the tip off a piping bag and place chocolate inside. Place a piece of parchment paper on a plate, and pipe a dark chocolate oval on the parchment paper, placing in the fridge to harden. Melt white chocolate with coconut oil, and divide into two bowls. In one bowl, color your chocolate yellow. In another, mix pink and yellow to make orange. If the chocolate starts to get too stiff from mixing in colors, add a bit of oil to help liquefy. Cut tips off of two piping bags, filling one with orange chocolate and one with yellow chocolate. Pull your dark chocolate oval out of the fridge, and then pipe the Incredibles 2 logo design on it. Place in the fridge to harden. Place smoothie ingredients in a blender and combine, then pour in a bowl. Place hardened chocolate design on top. And there you have it! 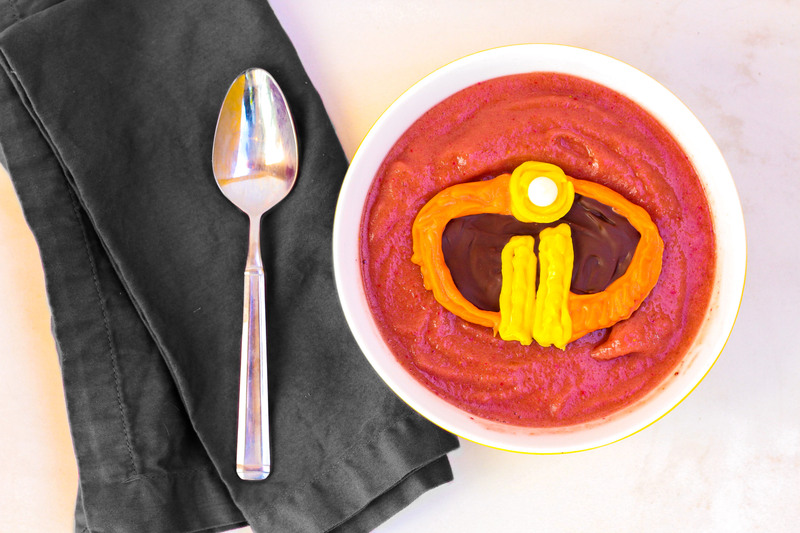 An Incredibles 2 inspired smoothie bowl, to help tide you over until Incredibles 2 comes out in theaters June 15th!